My kids are out of school in less than a month and I am scrambling to squeeze in as much sewing time as I can before summer vacation! This week I had two whole days (yesterday and today) where my schedule was completely empty. That's a very rare occurrence for me this time of year. Between end of year testing, track meets, field trips, dance practices, cub scouts, class parties, and my husband's crazy work schedule we barely have time to sit down for family dinner anymore. So, yesterday, with an entire day free I decided to ignore all my household duties and sew all.day.long! It was blissful, I tell you. 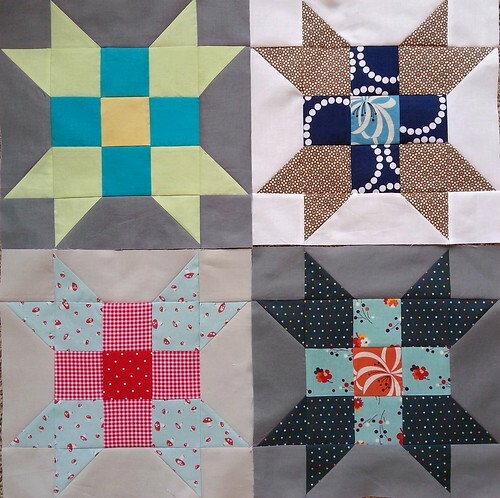 I was able to get all my blocks done for the May edition of the Sew Pieceful Swap! I'm sure my bee mates think I'm an over achieving psycho for getting them done so quickly but I know my time is quickly slipping away. I've got to take advantage of every small window of opportunity that comes my way. For my blocks I chose to knock-off this design. I didn't actually join the club but rather just figured out the design and adjusted it to the finished size I needed. I actually do this quite often as I'm pretty good at figuring out designs and dimensions. I couldn't resist making a block for myself as well. Still super happy about my color choices. I am shamefully behind on my other bee commitments, so today I'm planning another round of Ignore-My-Housework. Hopefully, at the end of the day, I'll be caught up...!! 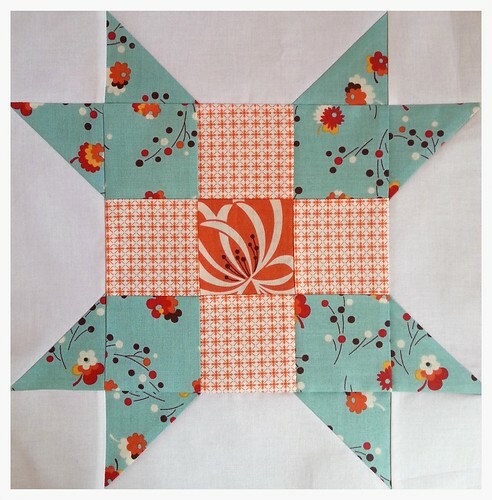 Linking up to Show and Tell Tuesday and Fabric Tuesday. I like the navy dotted block as well as you own the best out of all of them. What fabric is the blue in the bottom picture? I see it often and love it! Brilliant blocks! I love the flea market fancy fabric - one of my all time fav's!! !